Optimal location at the Royal Square. Large outdoor seating area, I had lunch there twice, but the second time service was extremely slow. Liberation on cask, a few keg beers. Right next door to "The Peirson" which makes for a short pub crawl! 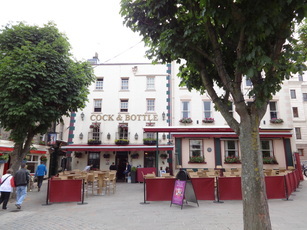 Small downstairs and upstairs bars but has a big ouside drinking area which is nice on a summer evening, sells "liberation" brewery beer which is ok but that is it for the real ale selection, good barstaff and a relaxed atmosphere. Another visit as this pub is excellent for a beer a snack and people watching. Always busy due to its location but we got a table OK. Liberation Ale was fine if not spectacular and they now offer a Craft Blonde Beer as well. Waiter/ress service appears only to be for food. Nice pub lots of character. Just the one hand-pull: Liberation. 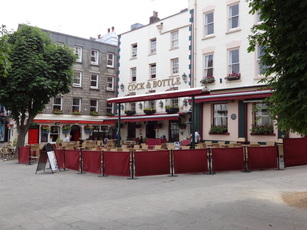 Extensive outdoor seating area in the Square. I tried the Liberation Craft Ale (on font rather than hand pull) which was very tasty. Food menu looked interesting although we didn't try it. Decent pub, 1 ale - Liberation. Great outdoor seating area.